EUR empowerment by the Fed minutes did not remain long since this currency was weakened after the disappointing Factory Orders reports in Germany. 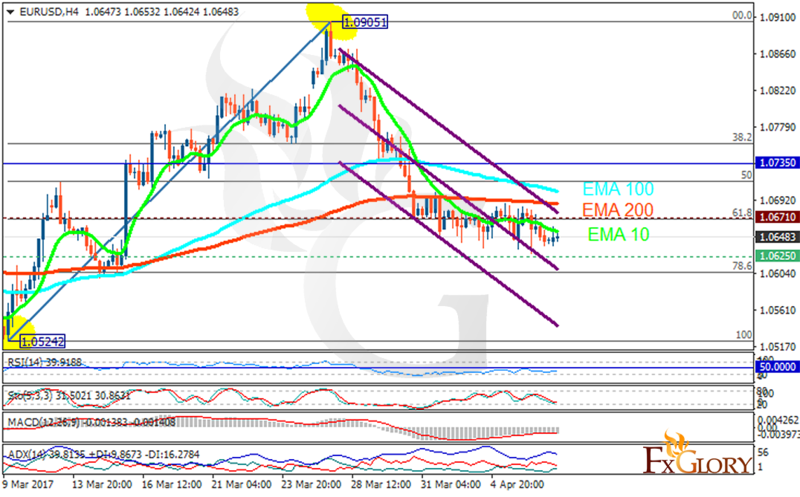 The support rests at 1.06250 with resistance at 1.06710 which both lines are below the weekly pivot point at 1.07350. The EMA of 10 is moving with bearish bias along the descendant channel and it is below the EMA of 100 and the EMA of 200. The RSI is moving horizontally below the 50 level, the Stochastic is showing downward momentum and the MACD indicator is in negative territory. The ADX is showing a weak sell signal. Considering the bearish signal that the indicators are showing, EURUSD may fall towards 1.60 however, it will continue its fluctuation within the resistance and support area.